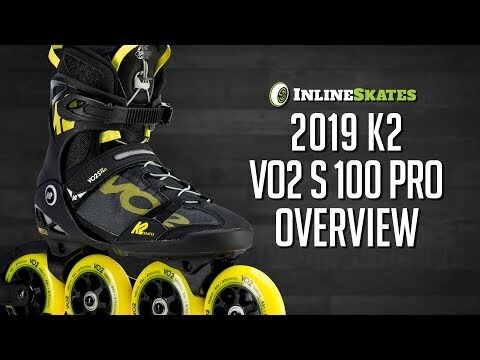 Part of K2's new VO2-S X-Training Series, the VO2-S 100 Pro Inline Skates are designed to give a killer workout perfect for athletes cross-training in the off-season. Featuring the unique one-sided VO2-S Frame, the VO2-S 100 Skate offers lightweight performance with precision and maneuverability not before seen on a skate. The skate's 100mm wheels offer a longer, stronger roll that is ideal for skaters who want to skate long distances. Combined with the smooth-rolling ILQ 9 Classic Plus Bearings, the VO2-S 100 Skate has a roll that rivals any skate on the market. The VO2-S 100 also come with K2's Vortech Ventilation System to keep your feet cool and comfortable, even during the most grueling of training days. The skate offers plenty of support thanks to the VO2 Cuff, and has a speed lacing system with laces, a Velcro strap and a buckle for a super secure fit. Take your training up a notch with the K2 VO2-S 100 Pro Inline Skates. 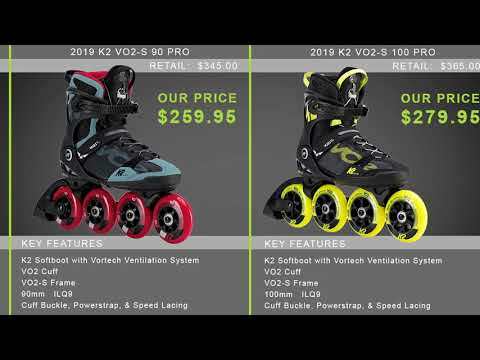 Q: I am attempting to purchase K2 VO2-S 100 Pro Inline Skates 2019 model, which are in my Basket and I also would like to purchase 8 - 100 mm replacement wheels and 16 replacement bearings with a rating of ILQ9, the same as the skates factory bearings. However, your online store only offers ILQ 5 replacement beatings, and this is what is holding up the order. A: You are correct, we currently don't have stock of the replacement ILQ9 bearings. If you're interested in placing and order and including those please contact customer service and they can place a manual order including the bearings which can be special ordered from the manufacturer. Q: Is the brake removable and can you get the skate in all black, minus the ugly yellow? A: Brake is removable and there is an extra axle included to remove the brake. There currently is no other color available in this skate.